Mature pear trees can grow quite large, and trees planted in a poor location will suffer if not moved somewhere they can mature. Pear trees transplant well provided they are moved at the proper time of year. When transplanting a pear tree, wait for an overcast day with low heat. Heat, sun and humidity intensify the already stressful transplanting process, and your pear tree may suffer. Water your pear tree for two or three days before you plan to transplant it. This helps loosen the roots before you dig up the tree. 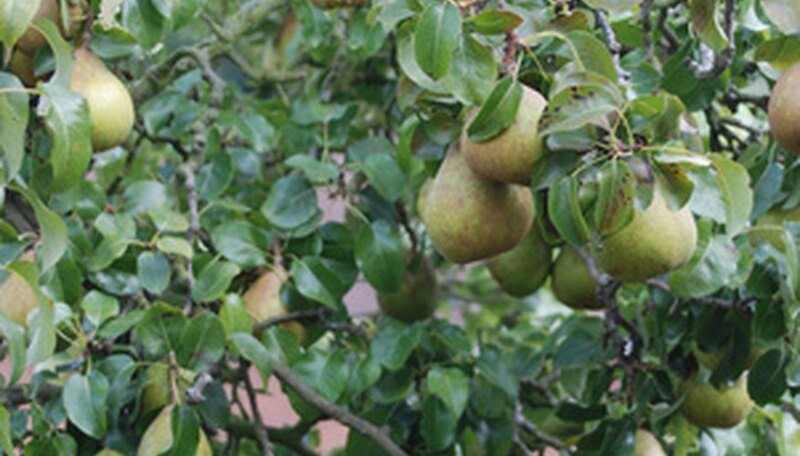 Select a new location for your pear tree in early spring, once frost danger has passed for your area. Transplant a pear tree while the tree is dormant and before it develops foliage. Choose a site that offers full sun and well-draining soil and leaves your pear tree enough room to grow. Dig a hole for your pear tree. Make the hole twice as large as the pear's root ball. Remove any rocks, weeds or competing roots from the hole. To determine the size of a planted tree's root ball, the University of Saskatchewan Extension Division suggests estimating 9 to 12 inches of root ball diameter for every inch of trunk diameter. Tie the tree's branches with twine so they don't get injured during the move. Position a wheelbarrow near the tree to transport it from the old location to the new one. Dig out your pear tree from its current location. Start digging at an area twice the size of the root ball you estimated earlier. Work into the soil with your shovel, slowly working in toward the estimated root ball. As you slowly expose the pear tree's roots, you'll be able to see where to dig. Continue working until you have loosened the pear tree nearly all the way. Then attempt to lift up the pear tree by grasping the trunk and tugging up. Cut any remaining roots that hold the pear tree in the soil if you cannot lift it up. Use anvil pruners or a sharp spade to cut them. Pull the pear tree out of the hole and place it in the wheelbarrow. Wheel the pear tree over to the new hole. Place the tree in the new hole so it's planted at the same level in the soil as before. Check to ensure the pear tree is vertically straight. Backfill the hole with soil until you have securely planted the tree. Water the newly transplanted pear tree until the soil compacts around the tree and becomes saturated with water. Continue to water the transplanted pear tree so its root system remains moist. This helps prevent transplant shock.